At first we couldn’t decide if we should make A13-OLinuXino to work from Li-Po battery, this seemed to be just increase of the BOM and price, so we made REV.A without this feature. 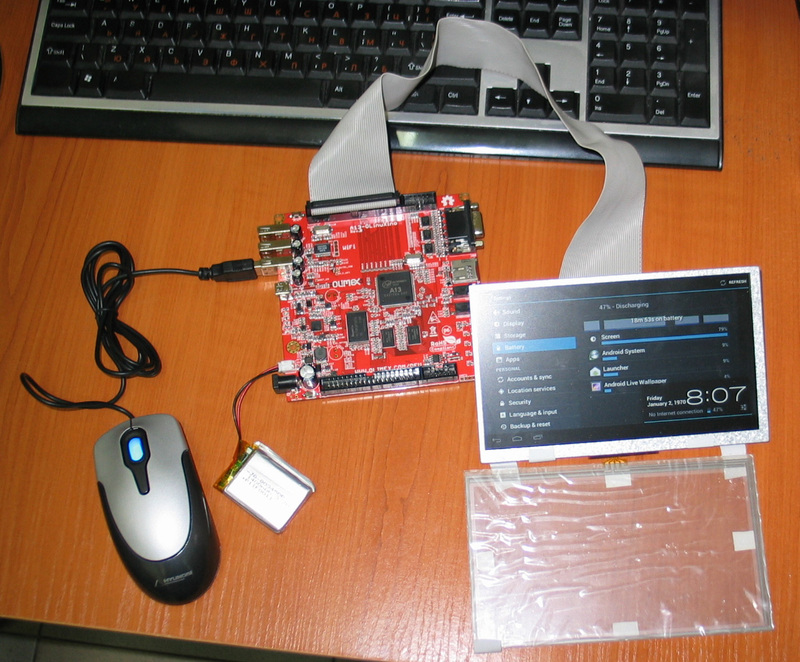 Now A13-OLinuXino Rev.B is assembling and we got some of the first boards to test with LiPo battery, the result is A13-OLinuXino now may run from single LiPo and support USB devices too thanks to the included boost DCDC. Some current measurements were taken while board was powered with 3.7V standard 1400mAh LiPo battery we have. Without LCD the board running Android consumes between 200 and 550mA depend on the different activities, when LCD is add the consumption rise with 450mA due to the backlight. When the board is in power safe mode the consumption drops to 3mA. Brilliant, any idea how much current it is drawing? Just did some power measurements and updated the post with the results. A13 running at 1Ghz needs just 2W !